The FDA is promising to crack down on e-cigarette manufacturers and sellers. 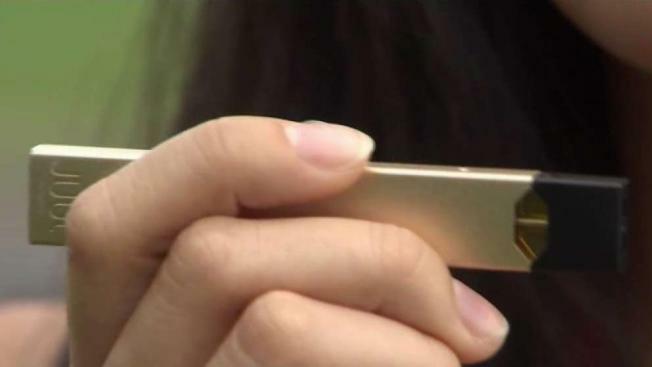 News4's Aimee Cho talks with a parent of a teen, and a college student who smokes a Juul. The FDA is considering restricting manufacturers from selling flavored nicotine liquid or making the products undergo an agency review. The Food and Drug Administration was prepared to embrace e-cigarettes as a way to wean adult smokers from cigarettes, but the agency is rethinking its approach after seeing scores of teens vaping. The crackdown by the agency includes historic action against more than 1,300 retailers and five major manufacturers for their roles in "perpetuating youth access," the agency said. "E-cigs have become an almost ubiquitous — and dangerous — trend among teenagers," FDA Commissioner Scott Gottlieb said in a statement. "The disturbing and accelerating trajectory of use we're seeing in youth, and the resulting path to addiction, must end. The FDA cannot tolerate a whole generation of young people becoming addicted to nicotine as a trade off for enabling adults to access these products." Across the entire e-cigarette category, the FDA is considering restricting manufacturers from selling flavored nicotine liquid or making the products undergo an agency review. Gottlieb extended an Obama-era deadline that would have required e-cigarettes on the market by 2016 to be reviewed starting this year. The FDA is specifically ordering five brands — Juul, Vuse, MarkTen, Blu E-cigs, and Logic — to submit plans within 60 days detailing how they will prevent teens from using their products. The agency may require the companies to revise their sales and marketing practices, to stop distributing products to retailers who sell to kids and to stop selling some or all of their flavored e-cigarette products until they clear the application process. A Juul spokeswoman said the company will work proactively with the FDA in response to its request. Representatives for the other four manufacturers did not immediately respond to requests for comment. As part of the FDA's largest-ever coordinated against illegal sales, the agency has sent warning letters to more than 1,100 retailers that are selling e-cigarettes to teens despite a federal ban on sales to minors. It has fined 131 retailers, with fines ranging from $279 to $11,182. These actions come after the agency conducted a blitz of both brick-and-mortar and online retailers between June and the end of August. The FDA warned and fined more than 60 retailers after its first retail effort this spring. Additionally, the agency is probing manufacturer's online shops are being used to make "straw" purchases, where buyers resell products to minors. If FDA identifies problems, it can take both civil and criminal actions. E-cigarettes are a major component of the FDA's sweeping tobacco initiatives, which includes its quest to lower the amount of nicotine in conventional cigarettes to minimally or non-addictive levels. These devices are billed as a less harmful way for adults who can't or don't want to quit smoking to continue receiving nicotine. However, any potential benefits to adults have been overshadowed by the surge in teen use. Juul dominates the market, representing about 72 percent of sales, according to Nielsen data compiled by Wells Fargo analyst Bonnie Herzog. Most Juul pods contain 5 percent nicotine, as much as a pack of cigarettes. Its eight flavors include sweet options like creme (formerly known as creme brulee), which critics say appeal to kids, not former adult smokers trying to quit. The FDA has already started the process of examining the role flavors play in both cases. Lawmakers, including Senate Minority Leader Chuck Schumer have pressed the FDA to do something to control youth use. Despite the criticism he faced, Gottlieb has remained largely supportive of e-cigarettes. But he repeatedly warned companies to seriously address teen use. "This isn't our choice alone," Gottlieb said. I've been warning the electronic cigarette industry for more than a year that they needed to do much more to stem the youth trends. In my view, they treated these issues like a public relations challenge rather than seriously considering their legal obligations, the public health mandate, and the existential threat to these products." Under Gottlieb, the FDA has embraced e-cigarettes as a potentially less harmful alternative for adult smokers. As part of Gottlieb's sweeping plan to overhaul tobacco regulation, he wants to reduce the amount of nicotine in conventional cigarettes to minimally or non-addictive levels. In doing that, Gottlieb recognizes he needs to give people who are already hooked another less harmful option.